According to 2008 data from the U.S. Environmental Protection Agency, 31 percent of the trash Americans send to landfills in a single year consists of paper products. Whether you’re interested in decreasing the amount of garbage your household produces or you’d just like to have an inexpensive source of compost for your garden, paper provides an excellent source of carbon for your compost pile. Take plenty of extra time preparing paper for your compost heap to minimize areas in the compost that could become oxygen depleted and lead to smelly, anaerobic decomposition. Find paper for your compost heap. Send the word out to your family, friends and business associates that you’re on the lookout for paper, and you should quickly accrue a large collection of this carbon-rich compost ingredient. Look for newspaper, cardboard, computer paper, paper towels and paper plates. Avoid photo paper and metallic wrapping paper. Shred the paper. Feed it through a paper shredder, if you have one available, or tear it into narrow pieces that don’t exceed 2 inches wide. Dampen thick paper materials with water to soften the fibers to make shredding easier. Toss a 3- to 4-inch layer of the paper across a 4-foot-square area of well-draining soil that receives several hours of direct sunlight each day. Mist the paper materials with a light spray of water, adding enough to make it about as damp as a wrung-out sponge. Top the carbon waste with an equal layer of nitrogen-rich organic materials, such as fresh grass clippings, cow or goat manure, fruit scraps, vegetable peels and coffee grounds. Spread a ¼-inch layer of finished compost or plain topsoil over the nitrogen waste to help jump-start the microbial activity in your compost heap. 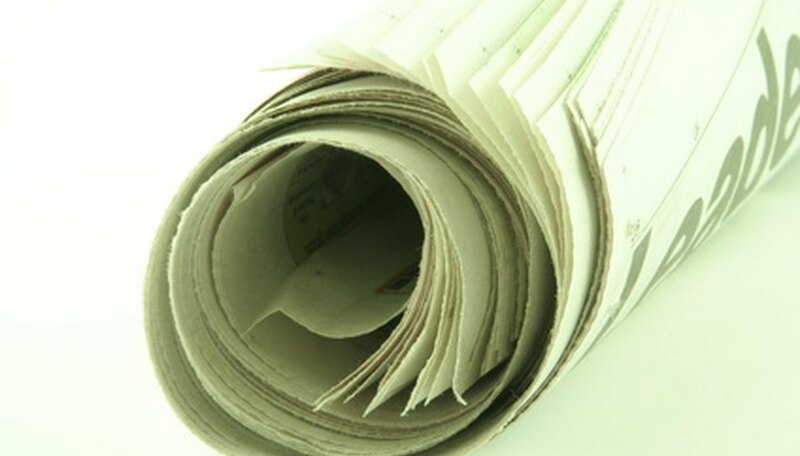 Place a second layer of paper waste on the heap, dampening it as before. Add another layer of nitrogen-rich waste. Repeat the alternating layers of damp paper and nitrogen waste until your compost heap measures minimally 3 feet high. Mix the compost layers at least once weekly, more frequently if you want to have finished compost in less than two months. Use a garden rake to shift the waste from the center of the pile to the outside edges. Then build the pile back up to its original dimensions. Compress a handful of the waste tightly in your hand; ideally, you should be able to squeeze out only one or two drops of liquid, according to the University of Illinois Cooperative Extension. Never compost manure from pets or meat-eating animals, since it could contain harmful pathogens that may infect humans.